ITM readers may be interested in this new book, Anthropocene Reading: Literary History in Geologic Times, just out from Penn State Press. 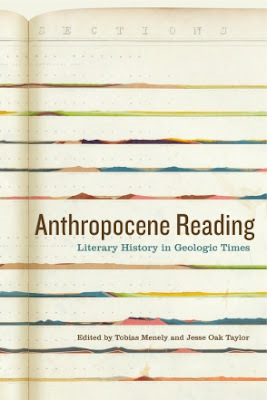 Edited by Tobias Menely and Jesse Oak Taylor, this collection provides something missing from most meditations on the Anthropocene, the era during which human impress is readable on the geologic record: historical depth. Well, it provides a whole lot more than that -- every essay in this collection is really wonderful -- but Anthropocene Reading includes a medievalist (yours truly) and an early modernist (Steve Mentz). Plus it's blurbed by Jan A. Zalasiewicz, my favorite palaeobiologist/geologist. Contributing to this collection was such a pleasure: the editors were so good at forming a sense of community around the project and challenging their contributors to be at once lucid and inventive. My essay is called "Anarky." (with a period like that) and offers a meditation on what stratigraphic reading could mean in action; what an archival unconformity might look like; how periodization is a spiral not a series of linear segments; and why the voice of Noah's wife matters as continues to cross the centuries. Riffing on the Chester Play of Noah's Flood, the essay is interrupted several times by Noah's wife "own" voice as she chooses drowning as a way of making things-to-be-lost endure. If you are interested in the book enough to want to purchase a copy for yourself, you can reduce the price by 30% with the code TMJT17 when ordered through psupress.org. And no, the press doesn't pay me for saying that. Books just want to be read. We’ve been thinking about how we read. About four months ago, the two of us planned to write a blogpost describing our own reading practices. Our goal was not just to share our own experiences, but to elicit responses – via comments on the blogpost, sharing the post on Facebook, tweeting it – that would allow us to learn more about the reading practices of others. We began by writing a few Facebook posts back in June to do some preliminary exploration along these lines: we learned about what kinds of books people are interested in, and we were surprised and delighted to learn about the commonplace books – some elaborately and beautifully decorated – that several of our friends and acquaintances keep. And then terrible things kept happening, all through the summer and into the fall, and it never seemed to be the right time to ask the ITM bloggers about the possibility of doing a guest post. But now the time suddenly feels right, because our collective conversations have turned toward self-care, and the care of others. We both believe that the crucial context for this undertaking is the way that reading is not only individual and private, but also communal and shared. This sharing can be actual, in real time (reading a book out loud to others, online blogging a book), or it can be virtual or imaginative, a community of readers linked by love of a particular book, or by a set of reading practices. This seems to us to be a potentially vital place for self-care and care of others, two impulses that seem to be contradictory but are in fact intimately connected. Reading practices can be part of a shared pedagogy, directed toward the ways we can begin to combat the injustice and harassment in our field and our world; we’ve been reading about the damage done by that injustice; we’ve been reading about the work of repair. As medievalists, we have been deeply moved to witness how that work of shared pedagogy is simultaneously a work of repair, as the community is forged and nurtured by the process of compilation and sharing, seen so vividly in the crowd-sourced bibliography led by Julie Orlemanski and Jonathan Hsy. This may be a moment to explore more widely the ways that our reading practices inform who we are – as individual readers, as members of a shared reading community, or members of several overlapping communities. How we read informs how we work and live. We see this as a space in which repair can happen. Below are our particular two histories of reading: one, a meditation on mental illness; the other, a consideration of time. Both are stories of loss and recuperation. We hope that by making these histories visible, by thinking about reading as self-care and as care for others, we can make a space for others to share their personal histories and practices: to be visible and validated in the ways we are all changing how we read. I’ve been a fan of the series A Song of Ice and Fire since I was a young teenager, when it first came out. I have a first edition of A Game of Thrones, signed by George R. R. Martin (and yes, I got that signature in person, trembling hands and all). When book number five came out, it was the summer of 2011, I had just passed both my Latin exams, and I was about to begin my comprehensives. I’ve been waiting for that book for at least six years, since the previous book came out in 2005; but really, it was more like eleven years, because, as all fans of the series know, books four and five were actually two halves of one whole. So I’d been waiting catch up on many of my favorite characters since before I went to college, and now I was in grad school. To put it mildly: I was excited for the book to come out. And yet, the day I finally got my hands on that beautiful book and took it to Christie Pits Park in Toronto, I wasn’t able to read it. That was probably the point at which I should’ve known something was wrong. But I’d been through feelings like this before: I had just finished four years in the publishing industry, working at a rewarding but demanding editorial job that required an immense amount of reading. Then, I’d often found it difficult to read for pleasure when I got home, and so I’d spent much of my leisure time talking to friends, watching movies, or singing karaoke. But this proved to be far more severe. I spent an entire summer trying to read that book, the book I’d looking forward to for more a third of my life, and I couldn’t do it. So it probably won’t surprise you that I also found I couldn’t do my comprehensives reading. For months, I tried to read my way through that list of two hundred books by brute force. I would hole myself up in a library or coffee shop, or if that didn’t work, I’d try reading while I was talking to someone in the Center for Medieval Studies common space or in the grad room at the History Department. But I was simply too slow. I’d find myself rereading a single paragraph over and over, or puzzling out every single footnote, or listlessly staring into space. Eventually, the only solution I found was to write while I read. I made myself a schedule of the books and time I had left, worked out how many books I needed to get through per day, and sat myself down in the Pontifical Institute of Mediaeval Studies Library with a notebook and a pen. I would take notes while I read, do a summary at the end, and then ruthlessly move onto the next book. I went through something like four notebooks that way, and eventually, I did pass my comps. Since that time, I’ve heard other people—especially other grad students, especially other women—talk about similar things happening to them. How we read is not simple. It’s as complex and anxiety-ridden and idiosyncratic as anything else we do as academics, and no one talks about it. Goth(ic) reading, anxious reading, queer reading, intersectional feminist reading, speed reading, slow reading, reading in translation, reading for translation, not reading, transitional reading, required reading, preparatory reading, reparatory reading, reading for pleasure, punk reading, rebellious / resistant reading, professional reading, (eco)critical reading, monstrous reading, audio as reading, accessible reading, inaccessible reading, reading in transit, affective reading, fannish reading, amateur reading, nationalist reading, international reading, reading without borders, reading against borders, identities of reading, reading as justice, reading for work, reading as work, hierarchies of reading, prestigious reading, “trashy” reading, camp reading, performative reading, religious reading, reading together, reading alone, reading things that aren’t meant to be read, reading between the lines, digital reading, analog reading, impoverished reading, reading spaces, reading practices, reading histories. Responding to Kaitlin – initially, in a real-time conversation about ‘How we read’ earlier this year, and now, in written form – I want to mirror what she’s written above. I’d like to begin by seconding the call for your accounts of multiple kinds of reading, and then move on to say something about my own perspective and private experiences of reading, in the hope that this account might stimulate others. For me as a child, there was a very special pleasure in reading fast. My fourth grade classroom had a strange kind of projector device that was meant to improve our reading speed: it projected a single line of text on the wall, moving more or less rapidly (you could set the speed), until the passage was finished. Then you would complete questions designed to measure reading comprehension. I gamed that machine until I could read (or at least skim) about 1200 words a minute. It was a kind of trick, but it also produced a certain kind of flavor of reading pleasure: a highly superficial, super-fast, super-shallow engagement with language. In some ways, this facility turned out to be valuable. As the years ticked by, the ability to read a lot of text very quickly, retaining only what was essential, was a crucial strength. I encouraged others – first, peers; later, students – to develop this same skill, believing that it would help them as much as it had me, making it possible to manage very large amounts of text in a short period of time. But as you will have guessed, and as is always the case, there was a necessary trade off: could it be possible to have that facility for quick reading, and also muster up the ability to slow it down, to read in a deliberate, careful way? Up to a certain point, it was absolutely possible to maintain those two modes. But like Kaitlin, who describes in moving terms what it was like to lose (terrifyingly) the ability to read for pleasure, I also came to a point where I could no longer hold these two modes in tension. It became extremely difficult to read deliberately, slowly, closely. And the painful poignancy of this lay in the fact that those moments of deliberate, slow reading were among the most precious moments of my intellectual and, I would say, spiritual formation. To read highly compressed, distilled language – whether poetic verse (Whitman; Stevens) or sacred scripture (Leviticus; the Qur’an) – is to exit linear time, if only for a moment, to be in a separate in-between place where chronology stops mattering and you fully inhabit the single moment. Losing – or, at least, almost completely losing – that ability was terribly painful, and I am still working, right now, to try to get it back. One thing that has helped me to do so is remembering what it was to read slowly. These remembered experiences include the time of learning, both in college and in grad school, how to practice close reading (both times with a focus on seventeenth-century English poetry and prose), as well as older, more primal experiences of reading. In particular, I have been remembering what it was like to read as a very young child, including both my own memory of learning to read, and my memories of teaching children in my family to read. These are stories I would like to tell at greater length: healing memories in themselves, they might also be stories that are good for sharing, and good for thinking with as we reckon with our own histories of reading, and our reading practices. In our recent conversations, both in person and online, Kaitlin and I have already learned quite a bit about how our own histories of reading – both our deep histories and our proximate, urgent histories – inform our teaching and research practices, as well as how they have shaped us on a deeply personal level. Do teaching and research inhabit a different environment within our sensibility, totally divided from our pleasure reading, or are these domains contiguous or even overlapping? Is reading a fundamentally passive act – made visible in that strip of words flowing through the projector’s light – or is it active? Is reading an act of consumption or an act of creation? Is it even, sometimes, an embodied form, as manifested in our vividly illuminated and lovingly scribed commonplace books? Please share your own histories of reading, and let’s discover together the shared pleasure that lies in this most solitary of acts – which is also, paradoxically, the act of most complete plenitude.